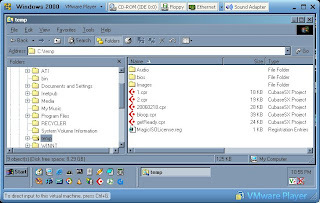 tech answer guy: VMware Player: no sound / "bad directsound driver"
VMware Player: no sound / "bad directsound driver"
UPDATE 7/6/2007: I have gotten sound to work using both a Windows 2000 Advanced Server and an XP guest system in VMware Server. You will need to apply the tweak below to enable sound. Apparently, VMware Player sets its config file for the virtual machine to use Sound Blaster emulation. When in truth, the emulation should be Creative AudioPCI (ES1371,ES1373). Just make sure to edit/add the lines while your virtual machine is powered off. It would be nice if VMware could somehow do a pass-through to the actual hardware device installed on the host so that you could do nice things like get low latency for recording software applications like Cubase or Reason. I will ask the gurus..
UPDATE: Pass through to the real sound card not possible with Workstation or Player. Sound only works as emulated. Kinda weak. But hey, its free and it works. Great! Glad I could help! Thanks a million for the tip. Worked like a charm for a Windows 2000 guest on a Windows Vista host. Good deal, Eric! Tally ho!